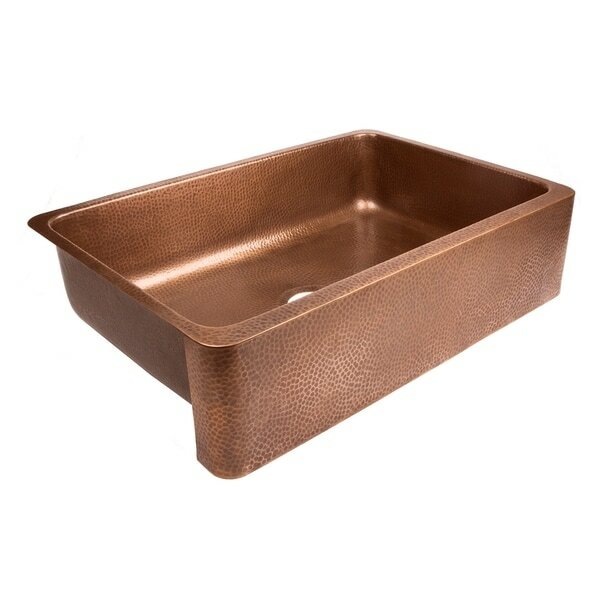 The Lange farmhouse copper kitchen sink from Sinkology makes solid copper farmhouse sinks even more affordable. The Lange single bowl kitchen sink is designed to be affordable without sacrificing quality. Each sink is individually hand hammered and finished by hand in our most popular Antique copper finish. Featuring an extra large bowl, this farmhouse sink makes kitchen chores enjoyable. The Lange by Sinkology also features sound dampening pads to reduce noise from garbage disposals and clanging dishes. As with all Sinkology kitchen and bath products, every product is protected by a Lifetime Warranty. Dimensions 32.0 In. X 21.5 In. X 8.0 In. Great quality and goos price. "What is the actual measurements of the apron?"